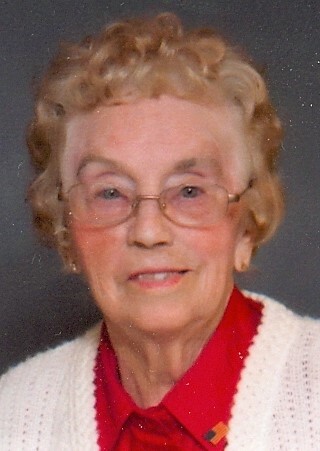 Gladys G. (Hoyt) Walen, age 93, resident of Cooperstown, ND passed away Wednesday, February 6, 2019 at the Golden Acres Manor in Carrington, ND. Gladys was born near McHenry, ND on August 28, 1925 to Fred and Agnes (Hoggarth) Hoyt. She attended her first eight grades of school at Paradise #4, Eddy County and graduated from McHenry High School in 1943. She then taught school in Sheldon Twp. For one year, and two years in Paradise #4. She married Andrew Walen on June 20, 1948 at Our Saviors Lutheran Church, McHenry, ND. They lived and farmed southeast of Glenfield until 1989 when they moved to Cooperstown, ND. Andrew passed away January 23, 2004. Gladys was a 4-H leader, Farmers Union Youth leader, president of Griggs County Council on Aging, board member of South Central Adult Services and Sutton Senior Citizens. She was a member of Glenfield Lutheran Church. Gladys will be missed and remembered by her son Alden Walen, granddaughters Tara Walen and Jessica (Walen) Jacobson, grandson Andrew Walen, great granddaughters Tenley Jacobson and McKenna Jacobson, great grandson Layne Jacobson, brothers Duwayne Hoyt and Edgar Hoyt, and many nieces and nephews. Gladys was preceded in death by her parents, husband, son Gary, sisters Verna, Betty, and Delores, and brothers Emery and Vernon.